Is U.S. Strategy against the Islamic State in Afghanistan Working? The United States has been confronting evolving threats from the Islamic State-Khorasan Province (ISKP). The latest April 2018 report by the Special Inspector General of Afghan Reconstruction (SIGAR) referenced “a spate of deadly attacks in Kabul” led by ISKP and the continuation of their “sectarian campaign targeting Afghanistan’s minority Shi’a community.” The United States’ growing concern about the influence of ISKP in Afghanistan is reflected in General Nicholson’s statement in November 2017 that a “lion’s share” of U.S. air strikes in the country go towards fighting Daesh. However, the relentless air strikes, which have killed over 20 leaders of ISKP in the last two years, have not deterred or otherwise incapacitated the group from launching massive attacks in Kabul that have claimed the lives of several Afghan civilians and government officials over 2018. The question that rises, then, is as follows: is the air strike-centered U.S. campaign against the Islamic State in Afghanistan as effective as the United States and Resolute Support says it is? Since the emergence of the Islamic State in Afghanistan in 2014, the United States has characterized its strategy to confront the threat from ISKP to be an outgrowth of its global strategy against the Islamic State in Iraq and Syria (ISIS). In July 2016, General Nicholson declared: “wherever Daesh metastasizes, as it has done so here in Afghanistan, …. we will go after it – and we are.” In November of last year, he revealed that since from March to November 2017, the United States, along with Afghan forces, conducted 1,400 ground tactical operations and strikes against ISKP, with a significant impact on the group’s overall strength. As per the latest briefing by Nicholson in May, ISKP is geographically limited to three areas: Nangarhar, Jawzjan, and Kunar provinces. In line with this strategy, U.S. air strikes have been targeting ISKP hideouts in Nangarhar and Jawzjan provinces on a near-daily basis. According to a Resolute Support press release, Afghan and U.S. forces have killed 90 ISKP fighters in 2018—most in Darzab district of Jawzjan province. Air strikes and ground operations (led by Afghan forces and supported by U.S. forces) against the group’s stronghold of Nangarhar have also continued, and just this week it was reported that at least 17 ISKP militants had died in a strike in the province. The United States has also been persistently targeting ISKP leadership. In just one year, the U.S. killed the first three emirs of ISKP—Hafiz Saeed Khan (26 July 2016), Abdul Hasib (27 April 2017), Abu Sayed (11 July 2017). The last two major killings include Abdul Rahman, who was running to succeed Abu Sayed, and Qari Hekmat, whose death has been described as a major blow to ISKP’s operations in the Jawzjan province. It remains unclear whether these air strikes, ground operations, and leadership targeting against ISKP have been able to seriously reduce the group’s territorial holdings and military strength. On the ground reporting somewhat contradicts U.S. government and Resolute Support statements that these offensives are seriously inhibiting ISKP. According to Afghanistan Analysts Network (AAN), the death of a former ISKP commander in Jawzjan province, Hekmat, has not led to a “visible weakening of the military position of the group in either of the districts they control,” contrary to Nicholson’s statements. With the appointment of Mawlawi Habib Rahman as his successor, the group is still in command of the districts. Similarly, Resolute Support recently announced that 22 ISKP fighters were killed during an operation that was conducted by Afghan Special Security Forces (ASSF) and U.S. Special Operation Forces on April 11th in Jawzjan province. However, AAN confirmed only a “few” ISKP fighters were killed in this operation. The AAN further quoted local officials who said that so far, no large-scale counter offensive has been undertaken against the ISKP fighters in the province. Even as U.S. forces concentrate on eliminating ISKP from its provincial strongholds, the suicide attacks launched by ISKP in Kabul and other urban centers have become a pressing concern for the United States, as the group has attacked a wide range of targets, including a voter registration center, a non-governmental organization, a Shi’a shrine, the offices of the Afghan Ministry of Interior, and a military academy in 2018 alone. General Nicholson recently highlighted how these attacks have offset the gains made by Afghan National Security Forces in reducing the number of attacks launched by the Taliban and the Haqqani network in the Afghan capital. 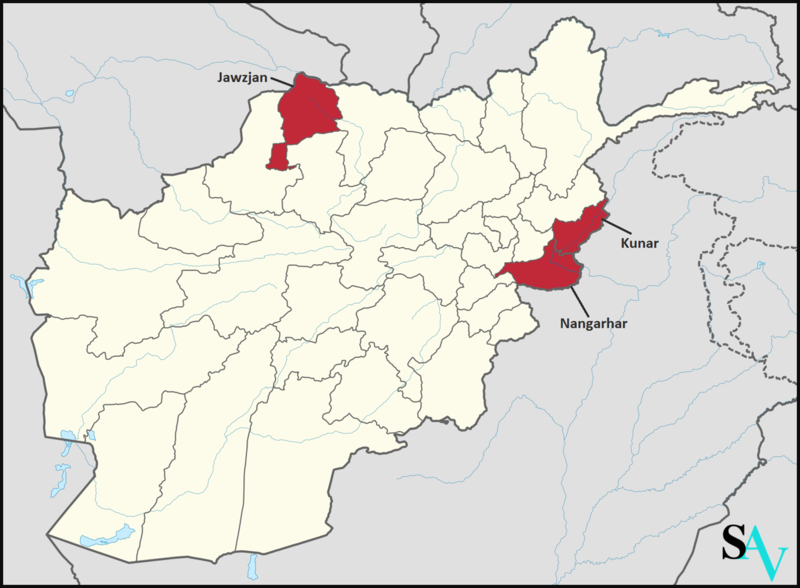 In this way, ISKP has begun to project power by targeting urban centers, a strategic shift that the United States and its Afghan counterparts have not yet been able to stymie. Despite the concerted onslaught by the U.S. and Afghan forces, ISKP has been capable of attracting disgruntled fighters from within and outside the region into Afghanistan. According to reports late last year, several French and Algerian nationals arrived in Darzab in Jawzjan province to join the ranks of ISKP. There have also been reports about fighters from Sudan, Uzbekistan, Tajikistan, and Chechnya travelling to Afghanistan to join ISKP. The threat of ISIS recruits joining ISKP’s ranks also remains unabated, particularly in light of the recently released video clip featuring an ISKP commander calling upon the fighters in Iraq and Syria to join ISKP. Moreover, as Nicholson recently indicated, ISKP’s capacity to increase the number of fighters in its ranks is linked to the attrition of fighters from the other 21 designated terrorist organizations in South and Central Asia. Decimating ISKP thus requires the destruction of not just the ISKP hideouts, but also the multiple militant groups in the region that have begun to uphold the ISKP banner. The resilience of ISKP to the relentless air strikes launched by U.S. forces should be of concern to the United States and the Afghan government. In this context, Lt. General Austin “Scott” Miller has been tapped to become the next commander of U.S.-led forces in Afghanistan. The appointment of the three Star General, who currently heads the U.S. Joint Special Operations Command, comes at a sensitive time in which Afghan and U.S forces are preparing for the upcoming country-wide district council and parliamentary elections. Miller’s experience in combat in Iraq and Afghanistan and as a Special Operations commander has led to praise that he is the best pick for the job, with some hailing his appointment as a signal of change in America’s approach to the Afghan conflict. The international task force designed by Miller to “track foreign fighter flows and terror plots across the globe” may help in monitoring and identifying foreigners who are travelling to Afghanistan to join the ISKP. Notwithstanding the change in command, any new U.S. strategy against the Islamic State in Afghanistan will have to combine air strikes with an effective ground campaign by the Afghan forces backed by the United States, while efforts should be made to prevent further ISKP-coordinated suicide attacks in Kabul and to curb the flow of allied militants. Additionally, there is a need to deploy reinforcements and logistical supplies to areas such Qush Tepa and Darzab, where ISKP continues to hold onto its strong military position as of mid-May. Without devising a strategy beyond the use of incessant air strikes, the U.S. campaign against ISKP will continue to fall short of eliminating the group. It was hard enough for Washington to ‘succeed’ in Afghanistan against the Haqqani network. Now add Daesh to the equation and this mountain has gotten harder to climb.